Like any sport, hockey has developed its own vocabulary over the years. These specialized terms are often confusing for those who are new to the game, and can occasionally trip up even the most devoted fan. As part of Grantland’s ongoing dictionary series, here are some of the key words and phrases you’ll encounter in your travels as a hockey fan. Advanced Stats (n.) — the generally accepted name given to a set of modern statistics that confuse real fans by relying on complicated concepts such as addition and subtraction. Atlantic Division (n.) — the name given to one of the NHL’s four divisions under the 2013 realignment plan. Is not to be confused with the division that contains all the teams that are actually close to the Atlantic; that would be the Metropolitan. Avery Rule (n.) — a hastily passed rule from the 2008 playoffs that forbids an offensive player from standing in front of a goaltender and waving his arms around like a complete dink. Bettman Point (n.) — an extra point awarded to the losing team in a game decided in overtime or a shootout. Also commonly known as the loser point, since hockey fans use the words Bettman and loser interchangeably. Big Ice (n.) — the international ice surface, which is 15 feet wider than the standard North American rink. It’s often credited with increasing offense, speed, and excitement by people who have never watched an international hockey game that wasn’t part of the Olympics. Blowout (n.) — a game in which one team has amassed a lead so insurmountable that a comeback by the other team is essentially impossible. In today’s NHL, that’s usually two goals (Toronto Maple Leafs excepted). Central Division (n.) — the division that, for some reason, contains all the teams whose logos are impossible to draw. Character Guy (n.) — in theory, a term used to describe a player who is a strong leader and who exudes a positive presence in the dressing room by displaying courage and resolve in the face of adversity. In reality, a term awarded exclusively to players who regularly agree to speak to the media. Clutch-and-Grab (exp.) — a reference to a common style of play from the Dead Puck Era in which defensive players blatantly got away with obvious interference, helping to destroy the flow of the game and reduce scoring. The league took decisive action to modify the rulebook, and current-day players are allowed to clutch or grab, but not both. Coach’s Corner (n.) — Don Cherry’s seven-minute segment during the first intermission of each Saturday’s Hockey Night in Canada early game. The only reason any Canadian owns a high-definition TV. Composite Stick (n.) — the modern replacement for the old-fashioned wooden stick, preferred by NHL players because they’re lighter, more flexible, and can somehow sense the exact moment to disintegrate in your hand, right before the other team scores. Concussion-Like Symptoms (n.) — a concussion. Corsi (n.) — arguably the most commonly cited advanced statistic, it measures the number of shots directed at each net at even strength. If you say “Corsi” into a mirror three times, an old sportswriter will appear behind you holding piano wire. Day-to-Day (adj.) — the term used for any injury where a hockey player has not had a limb amputated. Dead Puck Era (n.) — a period of hockey history, spanning from roughly 1995 to 2004, in which both scoring and excitement levels plummeted, thanks to an emphasis on stifling defensive systems. The era is over now. Not because scoring is up much, because it’s not, but because we all just agreed to say it’s over. Dive (v.) — embellishment when a guy on the other team does it. Embellish (v.) — diving when a guy on your favorite team does it. End-to-End (adj.) — a style of play in which both teams trade offensive chances with increasing frequency. Rare, but extremely exciting. It will inevitably be followed by a TV timeout, during which both coaches will scream at their teams to ensure it never happens again. Enforcer (n.) — what we call goons when we think they might be able to hear us. Fenwick (n.) — an advanced stat hurriedly created after it was discovered some casual fans were actually starting to get their heads around Corsi. Five-Hole (n.) — the space between a goaltender’s pads, and a common target for shooters. Commentators will often use it in a phrase like “he went five-hole on that goal,” since “he beat the goalie between the legs” just sounds wrong. Flow (n.) — term used to describe a player’s hair. Belongs to a class of hockey slang that also includes terms such as “gino” (goal), “apple” (assist), and “celly” (celebration) and is used by the worst people in the entire world. The Forsberg (n.) — a name given to a very famous breakaway move — namely, doing the “Kent Nilsson” when you are more famous than Kent Nilsson. FoxTrax (n.) — the glowing puck used on Fox NHL broadcasts in the mid-’90s. Saying that you kind of liked the FoxTrax puck is the easiest way to make a Canadian leap across a table and try to strangle you. Gordie Howe Hat Trick (n.) — a goal, assist, and fight recorded in the same game. Gordie Howe had only two Gordie Howe hat tricks in his 26-season career, a fact that by law must be included in any article that references them. The Hardest Trophy to Win in Professional Sports (exp.) — a phrase every hockey fan must use to refer to the Stanley Cup. Don’t worry about whether it makes any sense, just use it. Hat Trick (n.) — term used to describe three goals scored in the same game by one player. When a hat trick happens, every hockey fan is bound by tradition to take the hat they just paid $25 for, hide it under their seat, and then throw their friend’s cap on the ice before he can react. Icing (n.) — the act of shooting the puck deep into your opponent’s zone from your own side of the red line, punished by a whistle and a faceoff in the defensive zone without the benefit of a line change, unless it’s randomly waved off, which there’s a good chance it will be. Intense (adj.) — showing strong emotions and/or passion for the sport of hockey. Intensz (adj.) — nice try, Bobby Ryan. Intent to Blow (exp.) — a confusing and poorly understood rule that allows a referee to wave off a goal and declare a play dead even if he hadn’t yet blown the whistle because, in his mind, he had already decided to. Also the subject of more childish puns than any other rule. Lady Byng Trophy (n.) — an award given annually to the player judged to be most sportsmanlike, because the NHL is apparently your kid’s peewee soccer league. Mark Messier Leadership Award (n.) — an award given to a player who, based on history, will show impeccable leadership qualities in the coming months as he’s backstabbing his own team to go chase a Cup somewhere else. Metropolitan Division (n.) — an actual official name for an NHL division, starting this year. I have no joke for this. 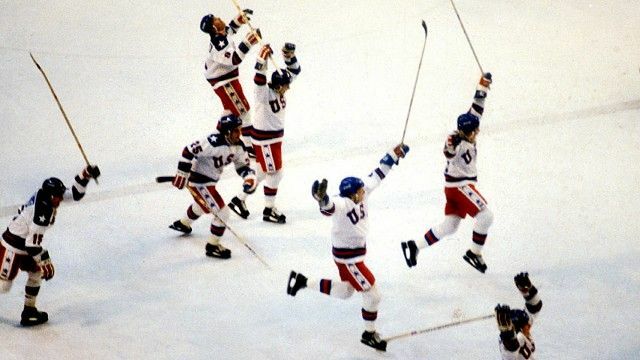 Miracle on Ice (n.) — the nickname for a win by the United States over Russia during the 1980 Olympics, which clinched the gold medal, as far as anyone remembers. Misconduct (n.) — a 10-minute penalty that can be handed out at a referee’s discretion for just about anything. Used primarily to get rid of anyone who might fight at the end of a blowout. Neutral Zone Trap (n.) — A defensive system that became popular in the 1990s and is widely blamed for causing the Dead Puck Era. If you ask any hockey fan how it works, they’ll reply, “By clogging up the neutral zone.” If you say that you know that but want them to actually explain how it works, they will say, “Hey, what’s that behind you?” and then run away. NHL 94 (n.) — the title of what is unanimously considered the greatest hockey video game of all time. NHLPA 93 (n.) — the title of what actually is the greatest hockey video game of all time. Old-Time Hockey (exp.) — a term popularized by the movie Slapshot that refers to a style of play that was not overly violent or aggressive. For reasons nobody is quite clear on, today the term is exclusively used by fans to describe a style of play that is overly violent or aggressive. One-Timer (n.) — a play in which an offensive player shoots the puck immediately off a pass without first stopping to control it. According to a generation who grew up playing EA Sports games, this is literally the only way to score in the NHL. Pacific Division (n.) — the division containing the seven westernmost teams, which the 95 percent of hockey media embedded on the East Coast must pretend to be vaguely aware of. PDO (n.) — an advanced stat that adds on-ice shooting and save percentages, with any result significantly higher or lower than 1,000 being a possible indicator of especially good or bad luck. PDO doesn’t actually stand for anything and was instead named after a blog commenter because of course it was. 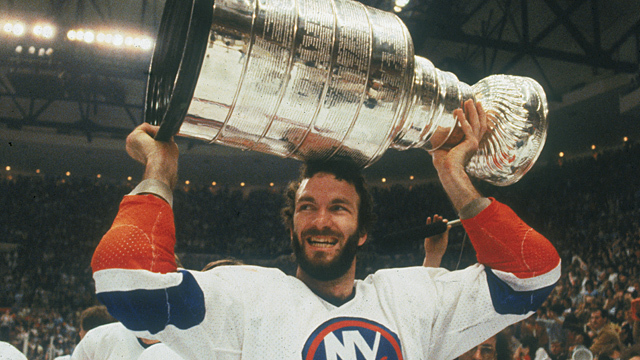 Playoff Beard (n.) — a hockey tradition that was actually kind of cool back in the 1990s. You’ll just have to trust us. Police (v.) — something that, according to many hockey fans, players were once responsible for doing for themselves, before the instigator rule came along and ruined everything by making it illegal to randomly pummel anyone they wanted. Quiet Room (n.) — the special area where, according to NHL rules, players who have suffered a head injury must be evaluated and cleared before they can return to the game. There is no record of this ever actually happening. Referee Microphone (n.) — a relatively recent addition to the league that allows the [inaudible] to announce [static] penal [silence] no goal [feedback screech] and a large fries. 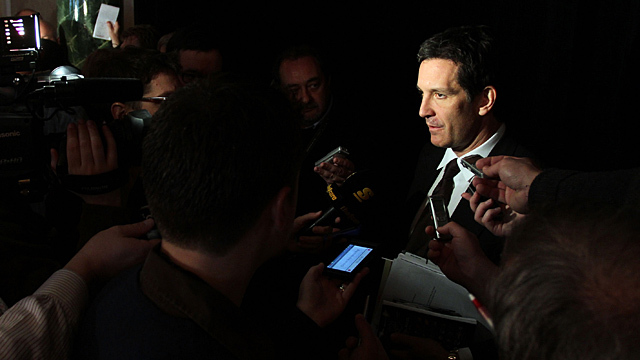 Scrum (n.) — a group of hockey players who don’t want to fight trying to look like they want to fight. Selke Trophy (n.) — an award given annually to the NHL forward with the most points who has ever been observed backchecking. Shootout (n.) — a skills competition used to determine the winner of a regular-season game that remains tied after overtime. Think the Home Run Derby, but without the competitive integrity. Slewfoot (v.) — the act of dragging your foot behind an opponent’s skates to trip him; considered one of the dirtiest plays in hockey when anyone else does it, but an unfortunate accident whenever that one guy on your team does. The Summit Series (n.) — a legendary eight-game series between Canada and Russia in 1972. Canada had been expected to dominate, but needed a dramatic come-from-behind victory in the final minutes of the last game to eke out a series victory, presumably because the Russians were so enigmatic. Timeout (n.) — the ability of each coach, once per game, to signal for a 30-second break between whistles. Was once used strategically to shift momentum, deliver fiery speeches, or draw up last-minute faceoff plays. Is now used exclusively to rest tired lines after a first-period icing call. Too Many Men on the Ice (n.) — a minor penalty the rulebook stipulates must be called whenever the Bruins are ahead in a crucial playoff game. 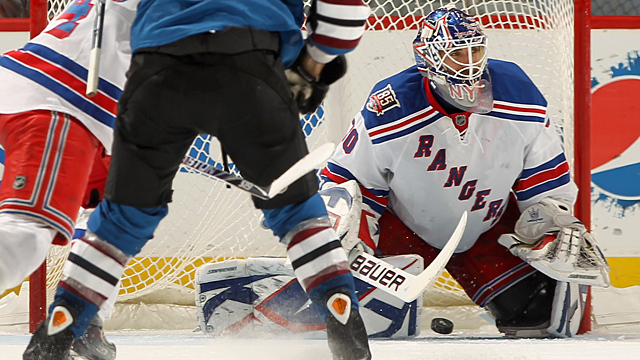 Trapezoid (n.) — the shape behind the net, introduced in 2005 to reduce instances of goaltenders handling the puck. Should apparently be called the “isosceles trapezoid,” according to a math teacher who wrote in and corrected us. Turtle (v.) — to duck or cover up in an attempt to avoid being repeatedly punched in the face by an angry man twice your size; needless to say, it’s an unforgivable sin. World Junior Championships (n.) — an annual tournament for players ages 19 and under that is really incredibly important right up until the moment Canada is eliminated. Zamboni (n.) — the massive contraption that can be seen slowly circling the ice several times a game but is not Douglas Murray.